Want a 2nd backup option for Veryfi? One where your collected financial documents can be automatically dropped into your Dropbox folder. Sounds interesting? In order to use the Dropbox integration service outlined below, you 1st must have a Dropbox account. If you already do then great, jump straight in. Otherwise go to Dropbox website and register for a Free 2 GB account. Once you connect Dropbox with Veryfi you will experience bliss. A world you never knew existed until now. Veryfi will quietly send all your receipts to your personal Dropbox folder. At anytime you can disconnect this connection. But rest assured, everything is safe. Including your Dropbox account. We never store any login information. 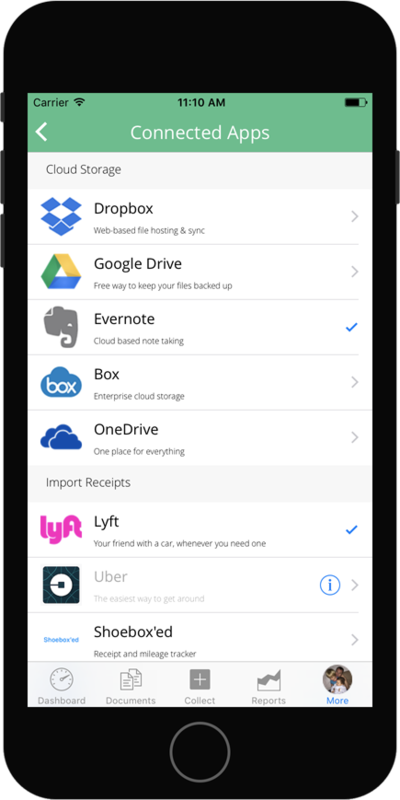 And most of all, all your receipts will now be backed up, synced, into your Dropbox folder. We do not store any of your login credentials to Dropbox. We only ask you to login once (when connecting) and establish a secure connection to Dropbox as per the Dropbox integration process. All communication between Veryfi mobile app and Veryfi servers encrypted over a secure connection (HTTPS/SSL). You will see a security bar during the app connection process. The team at Veryfi are industry experts in engineering, security & privacy. Feel free to reach out to us if you have any concerns or just want to chat. Pre-Req: You need to be a signed up member of Veryfi and have a Dropbox account. This is the only way to gain access to Connected Apps like Dropbox. Signing up is free and takes under 30 seconds to complete. Learn more about member benefits here and signup for Dropbox here if you do not have an account. 1. Inside Veryfi app, navigate to “More > Connected Apps”. 2. From the list, press “Dropbox” to begin the integration process. 3. Select the type of sync method you want Veryfi to use (pictured above right). 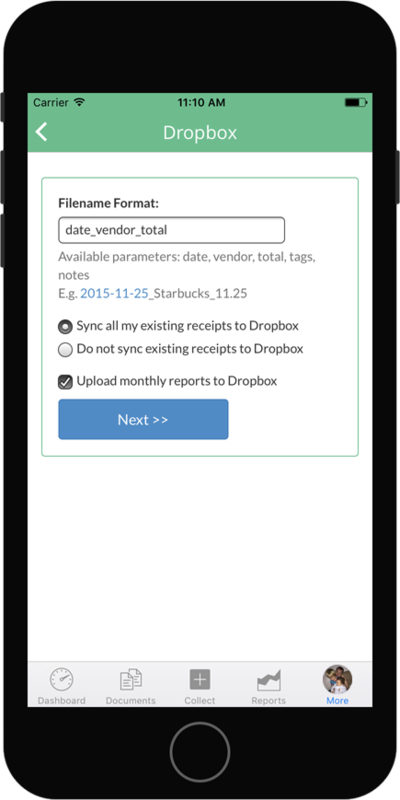 You can either sync all existing receipts in the Veryfi cloud to your Dropbox folder or sync just the new receipts. Hit Next. Bonus: Veryfi intelligence service will drop a monthly round up report free of charge into your Dropbox every month. This way you don’t have to do the monthly report yourself. We do it for your automatically. 4. Use your Dropbox account login to connect Dropbox to your Veryfi app. Once connected follow through all the Dropbox screens until you reach a done screen. 5. Once you press done, you will be taken back to the list of Connected Apps. Now the Dropbox cell has a tick next to it (as pictured left) to indicate a successful connection to Dropbox. To disconnect from Dropbox simply tap the Dropbox cell again. You will be prompted if you really want to disconnect. 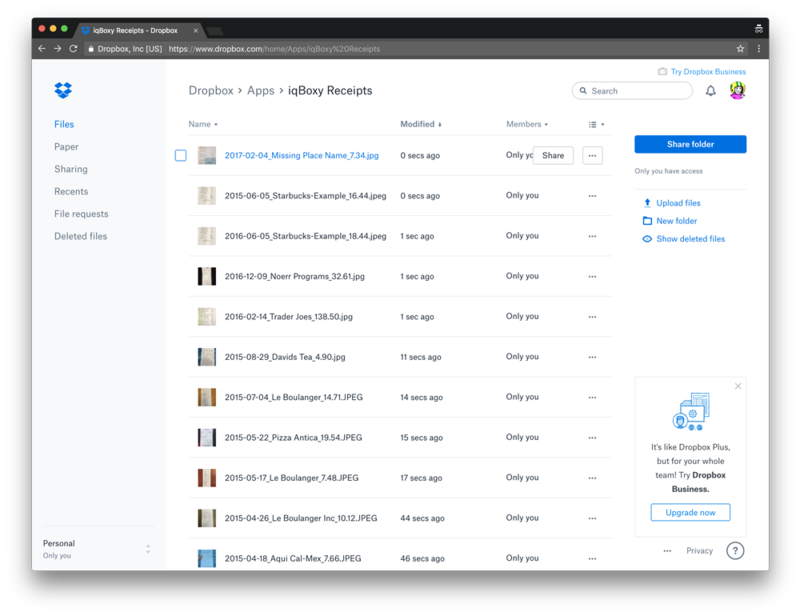 Based on the sync settings you selected above, you will start seeing your receipts and their meta data appear inside Dropbox under a folder called “Veryfi Receipts” (pictured below).